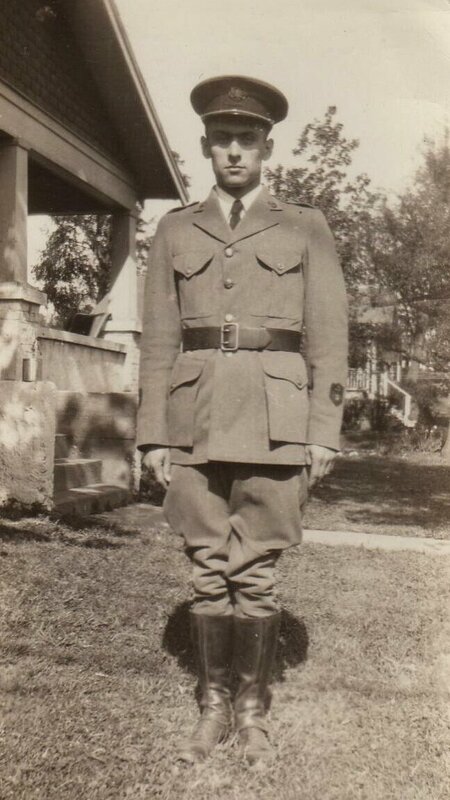 Dr. Isham C. Holland was born on a farm in Callaway County, Missouri on December 9, 1917. His relatives settled the old farm place in 1817, four years before Missouri became a state. He was the seventh of nine children born to Walker Kerr Holland and Alta (Coats) Holland. Isham was named after this great grandfather, Isham MeMahan. The name was pronounced as though it were spelled Icem. Isham’s parents were not Christians. Grandpa and Grandma Coats lived on a farm that joined the Holland farm. Isham spent much time with them. Since his grandparents were very religious people, there was always grace at meals and family prayers at bedtime. They had a deep influence on his life. Some of the early influences caused him to make some important decisions. One day when he was seven or eight years old, he was standing under a large ash tree in his front yard. He spoke to himself: “I will never smoke. I will never drink. 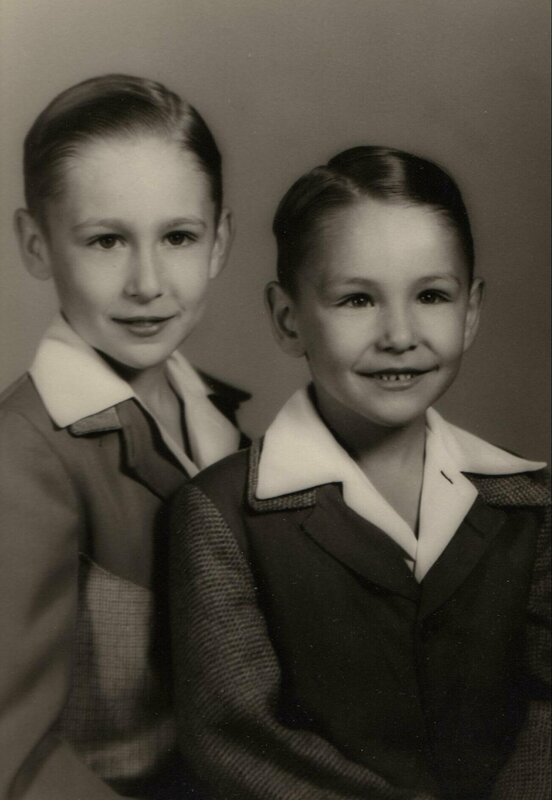 I will never dance.” Both his father and his oldest brother smoked tobacco, and they sometimes played for dances. Isham considered these things evil, and so never adopted the habits of smoking or drinking. Another time as a little boy, he crossed a large hay meadow. It was time for mowing, and the hay was higher than his head. Later he realized he had lost his pocket knife. A good pocket knife was an essential and a treasure to a farm boy. Isham was not accustomed to praying but was rather concerned so he said, “Lord, you know where my knife is, but I don’t. Help me to find it.” He walked back through the hayfield, directly to the knife. He was overjoyed. He never forgot that God showed him where his knife was. He attended the Ashland grade school. This was the same one-room schoolhouse that both of his parents had attended. In later years Isham taught there for three years as well. At age thirteen, Isham entered high school in Fulton, Missouri. He didn’t like town. Everything was so strange, so different. He did not know any of the students or teachers, but he did like to study and to learn. He did his best and made good grades. At high school graduation time, he was awarded the boy’s scholarship, having outscored all the boys in the class. During his senior year of high school, a revival meeting was held in the old country church that his grandfather had had built in 1886. Even though Isham had attended Sunday School a little (never regularly) he had never attended a revival. This time it was different, for he attended several nights during the two weeks of meeting. During this time he began to feel that he was a wicked sinner and guilty before God. He felt an awful lostness, a great guilt, and a fear of meeting God at death or the judgment while lost and unprepared. The meeting was scheduled to close on Sunday after two weeks of preaching. On the Sunday morning, Isham was at the back of the church between two of his cousins about his age. The pressure of conviction was strong upon him as they stood for the invitation song and the altar call. Isham spoke to his cousins, “Let’s go up front to pray.” They did not go, but sixteen-year-old Isham did. On November 25, 1934 God forgave him of his sinfulness! He was now a new creature in Christ Jesus. The revival continued for two more weeks. During this time one hundred people got saved. At the time of Isham’s conversion none of his family was saved. The next Sunday, however, his mother came to church and found God. During the meeting all of his brothers and sisters got saved, except for the youngest of the family and a married sister who was living in another state. They did get saved later. Isham’s father did not get saved until shortly before his death. From the very hour of his conversion Isham was a changed man. God had gained his attention, and he could not afford to be distracted or to lend any influence to anything that would hinder. The night of his conversion Isham prayed with seekers at the altar. He testified to victory at almost every opportunity. In the hallway of their large, old country house was a very large “Family Bible” which had belonged to Isham’s great-grandfather. Using this, he began the practice of reading from the Word of God every day. There were many places of prayer – in the barn loft, over in the woods. Often in warm weather, he would go out to the grass-lot or pasture at night to pray. As soon as Isham began to earn any money, he started tithing one-tenth of what he earned. The Hollands felt that they should be at church for every service. Inclement weather was no excuse for not attending the services. If there was no other way to travel, they walked. Soon after his conversion, he was asked to teach a Sunday School class. It was a large class of new converts, almost all older than Isham. Any time he was asked to take part in church work or to lead a prayer meeting, he accepted the task. Before long, this 19-year-old young man received requests to come to other places and speak. Once he received a request by postcard to come to a community where he had never been, to speak at a family reunion. It was a hot summer day and the yard was filled with people. Isham knew only the people who had called him. God honored his preaching and at least one woman became so convicted that she never stopped seeking until she knew she was saved. Over a period of time, the conviction that he was to represent Christ by preaching the gospel continued to grow. Isham was a senior in High School in Fulton, Missouri at the time he was saved. Before graduation, he took the State Teacher’s Examination and was awarded a teaching certificate to teach in the one-room school where one teacher without any assistant taught all eight grades of the elementary school. He secured a teaching job in a community where he was a stranger. In the eight-month term of his first year of teaching he earned $400.00. The people of the district were not church-going people for the most part. Even so, Isham felt that he should open each day of school with the Bible and prayer. He secured a copy of Hurlburt’s Stories of the Bible so that the children could easily understand. For the first year he walked or rode a horse to school. The round-trip was about fourteen miles, so he got a lot of exercise. His income was fifty dollars per month the first year. He received a raise to fifty-five dollars the second year. He also received two and a half dollars per month for doing all the janitorial work. This included carrying in the wood and building fires in the wood-burning stove. In the fall of 1937 he enrolled at the University of Missouri. One day at a holiness camp meeting, Isham developed a friendship with Carol Yocum. She was the oldest of five children by Delmar and Olive Yocum. As a child she had given her life to God. She was serious about living for Christ. She held high ideals and was careful and consistent in her life. They lived a long distance apart and so only saw each other a few times a year. As they kept up a serious, steady correspondence their friendship deepened. Isham realized that as a minister of the gospel it was especially important that he have a dedicated companion who was well-suited to him intellectually as well as spiritually. They both prayed much about their future relationship. 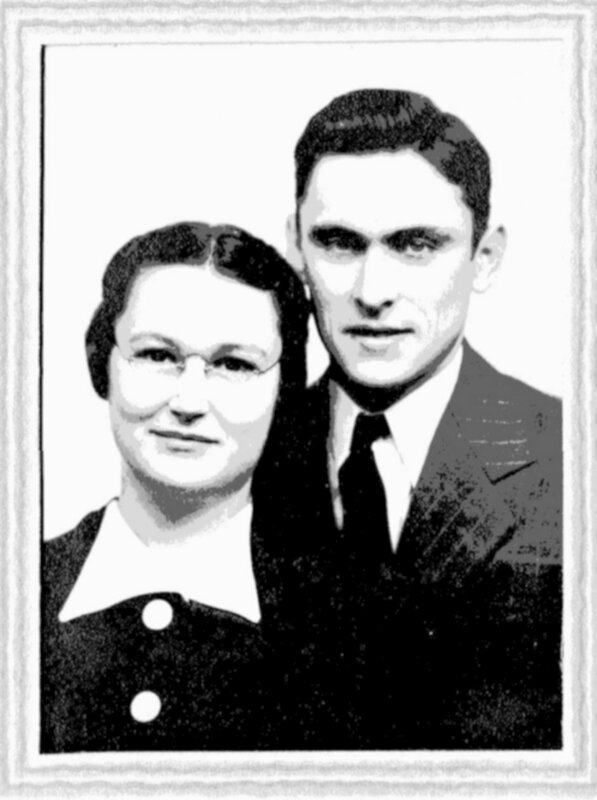 They felt that God was pleased so after Carol had attended Business College and Bible College and Isham had almost completed a course for a degree at the University of Missouri, they were married. They had a very simple wedding ceremony on June 2, 1940 at pastor C.E. Cowen’s home in Columbia, Missouri. It was on Sunday. 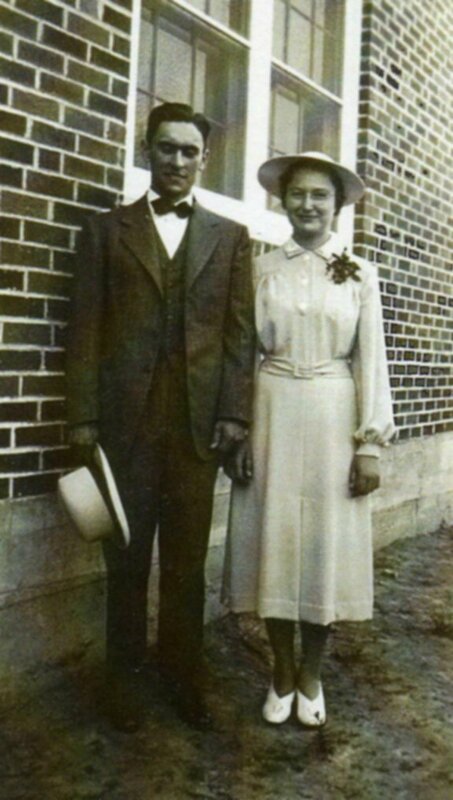 Isham preached that morning in Fulton, Missouri, and after lunch drove to Columbia to be married. After the ceremony he and Carol returned to Fulton where he preached that night. The bride made her own dress and Isham somehow managed to buy a new suit. From 1938 until 1941 he served as an assistant pastor under C.E. Cowen at the Fulton, MO church. In 1941 his first son, James Nathan was born. He graduated from MU in 1941 with an B.A. in History and the Humanities. This was quite a change for a country boy. There were different thoughts, theories and challenges, but he knew that God was the same and his covenant with Him was unchanged. The university work was at a fast pace with high expectations. The students were told by their Latin professor, for example, that they were expected to spend two hours’ preparation on each lesson. The history professors regularly assigned long, long sections to read. Isham studied late in the night daily except on Sunday. In addition he preached twice every Sunday for all but his first year at college. Most of his college work was concentrated on Latin, Greek, literature and history. He tells of one interesting incident: “In one English composition course we were given the assignment of writing a theme on an important topic: ‘The Most Important Happening In My Life.’ At once, I had my subject: my conversion. I told how as a sinner teenager I attended a revival meeting in a country church where the truth was preached in earnestness, how I became deeply convicted of my sin and my guilt before God, how I feared death and the judgment. Then I told of the invitation to seek the Lord to be saved, how with tears and prayers I sought the Lord at an altar of prayer, how I confessed my sins and repented of them. I told of the moment the burden of sin was lifted, the guilt and fear were gone, and I knew I was forgiven. I told of the joy of the Lord. I told about asking forgiveness of people and of making restitution for wrong doing. Then I told of a later conviction of the need of a pure heart and of my response to the preaching of the need of sanctification and the experience of holiness, of that magic moment when on the basis of obedience, consecration and trusting faith, I was enabled to trust the promise of God, the help of the Spirit and the cleansing blood of Christ and the witness of the Holy Spirit to my heart that the work was done. 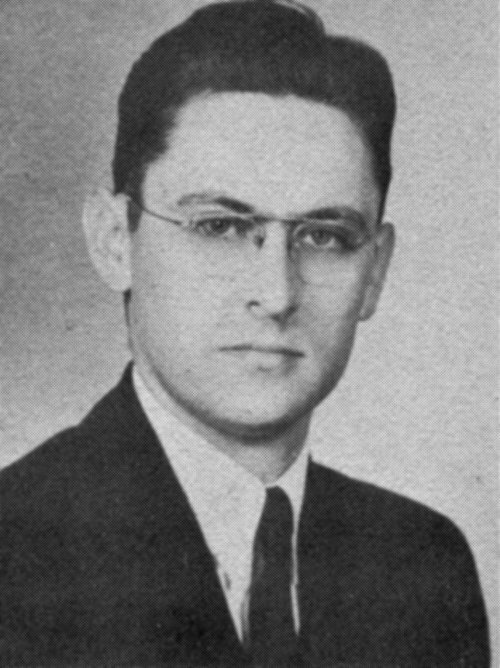 After completing his degree Isham was asked to stay and take a teaching position in the history department at Missouri University. He felt, however, that he was needed more elsewhere. In 1942 he took the pastorate at the Moberly, MO Church of God (Holiness) and continued until 1945. During this pastorate their second son, Philip Dale, was born in 1944. Leaving the Moberly church, they assumed the pastorate at Bynumville, MO in 1945. During this time, he was engaged also in Bible school work at Overland Park, Kansas. The school had been located on its present campus for two years when he joined the staff in the fall of 1943. The family moved from Moberly, Missouri to the campus of Kansas City College and Bible School at Overland Park, Kansas. At that time Isham was teacher and dean, and the following year became vice-president a position he held from 1944 to 1978. During the three years they lived on campus he traveled to Moberly and Bynumville to continue his pastoral duties. Life was busy. Most of his teaching was in literature, Latin, and history particularly ancient history and Old Testament history. In 1946 Isham received a call to pastor the church at 29th and Askew in Kansas City, Missouri which had originally been the home of the Kansas City College and Bible School. He served this congregation for 38 ½ years in three different locations. While still at 29th and Askew they purchased property in the Swope Park area and built a new church which was completed in 1955. The church at 29th and Askew was sold to the Starlight Baptist church. In 1968 they located a property farther south. Bro. Holland looked at the property of five acres with a nice house at the intersection of Gregory Blvd. and James A. Reed Road and asked how much the owner wanted. He was told that he would sell it for $58,750.00. The church board readily agreed to buy the property. When Bro. Holland returned to talk to the owner he was told that he would sell but that he must wait until he returned from a four-week trip to Hawaii. Bro. Holland was making a three-week trip to Jamaica at the time so they agreed to wait until later to consummate the agreement. Unfortunately the owner unexpectedly passed away shortly after his return to the states. Bro. Holland felt that he should talk to the widow about the agreement. She soon notified him that she would go ahead with the sale of the property. The beautiful Gregory Hills Church of God (Holiness) was built on the property. In 1973 the congregation was able to move into the new building. Bro. Holland was involved in ministry efforts outside the confines of his pastorate and the school as well. 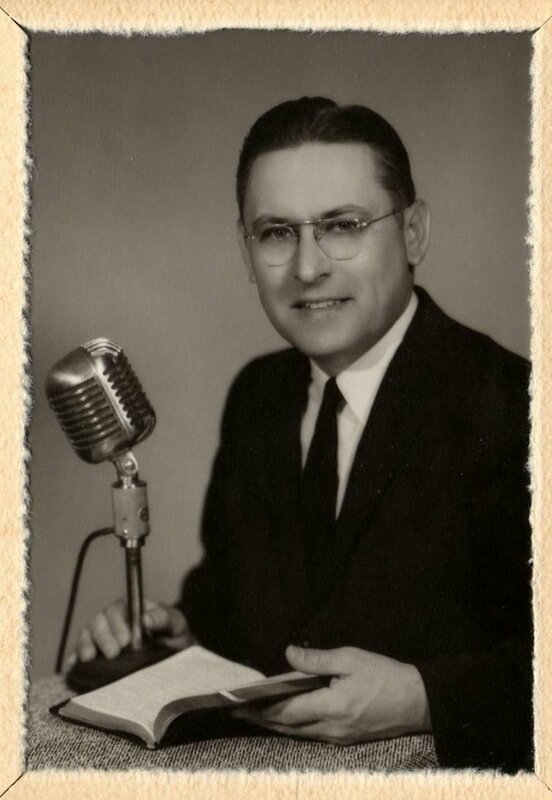 During the first three years of its existence, Isham Holland served as the spokesman on the Glorious Freedom radio broadcast. He has also been involved in writing lesson expositions for “The Way, The Truth and The Life” Sunday school literature published by the Herald and Banner Press. Shortly after accepting the pastorate in Kansas City, MO, he became a member of the Greater Kansas City Holiness Association. He served as its president at different times. 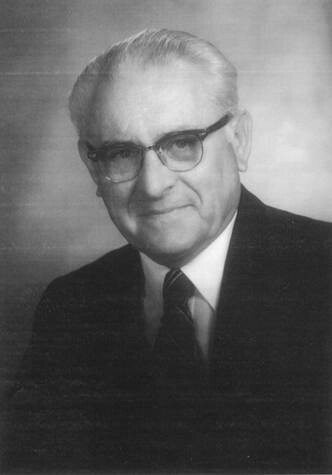 Dr. Holland served for over 50 years on the Foundation board of the Churches of God (Holiness). He served on the General Camp committee for over 60 consecutive years. He also served on the Publication board. Numerous times he served as the General Convention chairman. For fifty years or more Isham served on the Foreign Missions Board of the Churches of God (Holiness). For a good many years he was the board chairman. Mission interests carried him to many far-off places, sometimes for business, always for preaching and ministering to missionaries. This ministry took him to Bolivia nine times and a lesser number of trimes to Jamaica, the Cayman Islands, Haiti, the American and British Virgin Islands, Mexico, Nigeria and Liberia. In addition to this, Isham preached several camp meetings in the U.S.A., including several for the American Indians. He has an avid interest in the history of the Churches of God (Holiness) and has taught the a course on this subject for Kansas City College and Bible School. Because of his outstanding memory the remembrance of the past became a living experience for his students. One has described him as “a walking history book on the Churches of God (Holiness).” When asked about his amazing ability to remember names, dates and details of the past he said that it came easy for him. “I don’t work at it. To remember by association means that you have to remember twice as much. It just comes naturally.” he said. This gift served him well as the emcee of the General Camp and also the General Convention chairman for the Churches of God (Holiness). Many people have entered the Cowen Memorial Auditorium to attend the General Camp services to be greeted by Dr. Holland from the platform who called them by name, and asked about the health of their children each by name. In addition to their full years of ministry Isham and his wife Carol were able to fit in times of vacation. They especially loved to go to Minnesota and Canada. They made three trips to Saskatchewan, nine trips to Ontario and many trips to northern Minnesota. Bro. 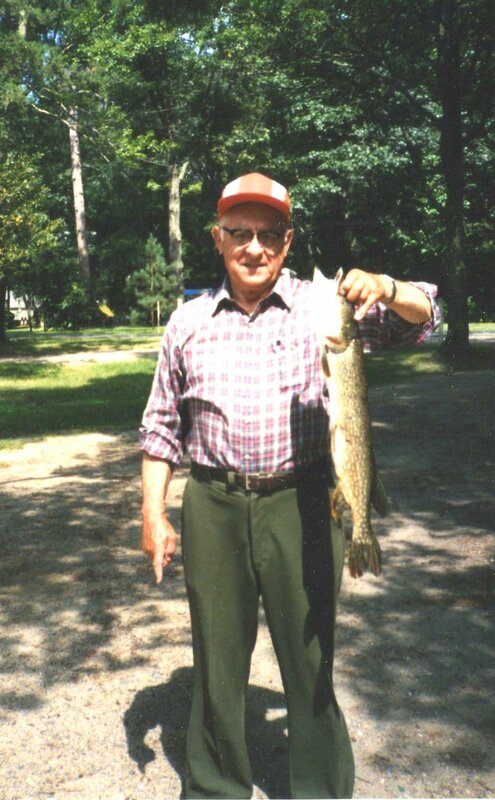 Holland loved to hunt and fish. Carol loved to cook for the crew during turkey and deer seasons as well as on the fishing expeditions. In 1984 Bro. and Sis. Holland decided that it was time to retire from the pastorate but not from the ministry. Isham resigned his pastorate at the Gregory Hills Church of God (Holiness) and served in an itinerant ministry. In 1986 the Kiriksville, MO congregation prevailed upon him to assume a pastorate. The congregation was blessed by his ministry that met their needs until he resigned in 1990. The Hollands loved to read aloud to each other. Together they read through everything written by Charles Dickens and much from Sir Walter Scott and Victor Hugo. 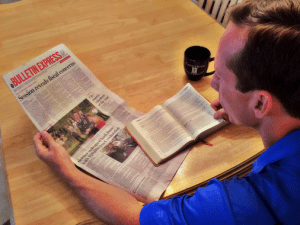 For many years on Sunday afternoons they spent time with their children and grandchildren reading Bible stories. One of his retirement achievements was to author a 152-page book titled “The Hollands and Their Kin: History and Heritage.” Much labor and many hours were devoted to the research of this significant volume. His wife Carol died on November 7, 2004 after a lengthy bout with leukemia. Bro. Holland cared for her faithfully in their home until the time of her passing. He was pleased that she was able to go home to heaven from their earthly home in Fulton. She left behind a loving husband, two sons, their wives, four grandchildren, ten great-grandchildren, and one great-great grandchild. Carol was a high school graduate of the Bynumville, MO schools. She later attended the Kansas City Business College, Mt. Zion Bible School, and Kansas City College and Bible School. In her earlier days she taught in a one-room school. She served several years as the children’s worker at General Camp and was the speaker for ladies’ groups at the Minister’s Conference. In their 50 years of pastoring, Dr. Holland considers his wife Carol to have been his best Sunday School teacher. 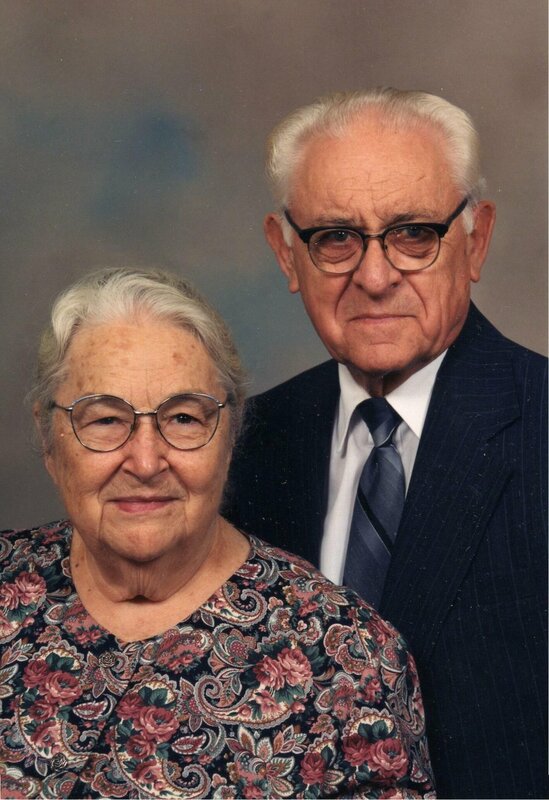 She was his constant support in ministry for 64 years. He says, “She was an expert seamstress, an excellent cook, and a perfect homemaker. She kept the home fires burning and made the pastoral contacts while I was away in revival meetings, camps, trips to the mission fields, and board meetings.” She also was able to accompany him on trips to Bolivia, Old Mexico, Jamaica, and the Cayman Islands. Dr. Isham Holland, complemented by the companionship in ministry of his wife Carol served God and the Churches of God (Holiness) well. This was a wonderful article about my childhood pastor. I attended the Swope Park Church of God (Holiness) from the time I was born until we later moved to the new Gregory Hills Church of God (Holiness) where I.C. Holland pastored until I was 24 years old. Words cannot express my gratitude to him for his teaching. I gave my life to the Lord at an early age under the teaching of Isham, and his influence held me steady throughout my school years and on into my adult life. Isham’s life made a huge impact on mine. My memories of Bro. Holland include his dedication to GOD and His work, but perhaps I was most impressed with the fact that he was a HAPPY CHRISTIAN! He was quick to laugh and his since of humor and wit endeared him to all he contacted. I will miss this brilliant man and am blessed to have known him. An amazing, dear man of God. He could walk right into the midst of the mass of people at the summer KCCBS General Camp meeting and identify and give detailed info about the people he met, a prodigious memory. Though I’ve long ago left CoGH sectarianism for more Christocentric Reformed Charismatic theology (see hopeinGod.org and desiringGod.org and ihopkc.org/prayerroom) I look forward to meeting Brother Holland and other CoGH saints in heaven around Christ’s throne when and where God will have corrected all our errant theologies making us ONE Body in Christ! Soli Deo gloria!